What is that Orange Thing on that Kid Kart? 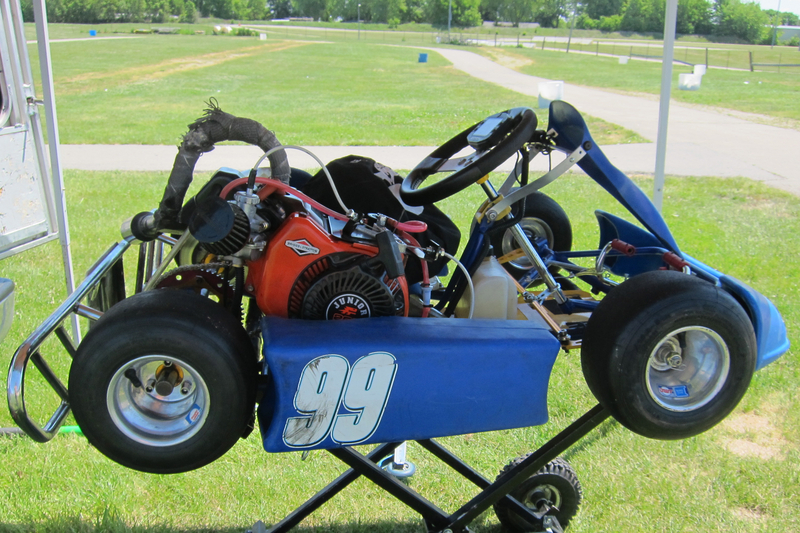 Some of you might be asking “what is that orange thing on that Kid Kart?” Until recently, most kid karts run a 50 cc comer motor. The comer motor is a purpose-built 2 cycle racing motor similar to what can be found on older grass trimmers and other small lawn equipment. They produce somewhere in the area of 2-3 horsepower. 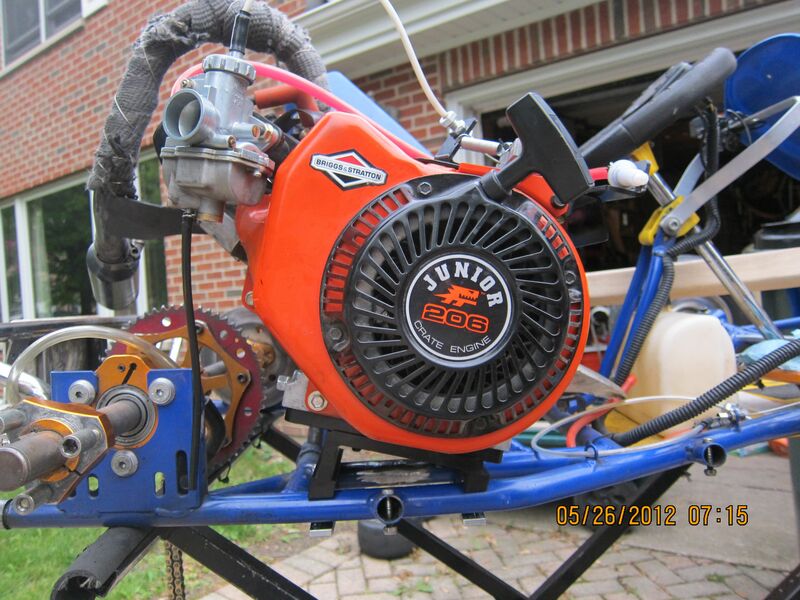 What is pictured below is a Briggs & Stratton LO206jr. It is a 206 CC 4 cycle purpose-built racing motor similar to the motor on riding mowers and other similar equipment. That looks and works much better. It has a very long carburetor slide to limit fuel and air imput. With the above limits it is very close in speed to a well-tuned Comer 50. The best description I have come up with to define the differences between these two motors is that the Comer 50 is a highly tuned Honda Civic and the Briggs is a stock V6 Mustang. The Honda is going to be faster in the corners but the Mustang is going to be faster in the straights. Since the kart chassis are the same, unlike a Civic and Mustang, the racing between the two is very interesting. The main advantage to the Briggs motor over the Comer is the rules. With the Comer you can modify and blueprint the motor, and you can game the system of rules easier. There are folks out there spending $4500 on a kid kart motor alone. With the Briggs 206jr you can’t open the sealed case nor can you modify the head. The rules allow very few modifications. The list price for the motor is ~$500. Even after the driver has grown out of a Kid Kart, you can take the same motor and for $100 in parts, move it to another LO206 class. Even after that, you can strip it down open-tuned and run in the Animal classes. The main purpose of this motor is to make the driver the factor in the race and not who can spend the most on a motor. This Sunday we practiced at CHMS. We have never seen the same kid karts there more then once. The week was no exception. Regrettably, Jason and our new friend collided when the other driver spun in the second corner. Jason had no place to go and drove right into into the other kart. Thankfully, no one was hurt but the kart was tweaked and the steering arm was bent. Despite that he put in some of the fastest laps of the day. Jason is a pretty agressive driver and does ok with kids that are up to speed, but every time we get on the track with someone who is still new we seem to wreak. Well, as they say “That’s Racing”, though I think we might limit our practice when there are newbies on the track. Jason has really starting to bring on the speed at this track. He started the day running 45 second laps and ended the last session in the 43s. We discovered that his fastest time was 43.08 seconds a few weeks ago and the track record for Comer karts is 42.16. I expect that sometime soon he will crack the 42 second mark. Over the summer, as he gets more time at the other two tracks he runs, he will pick up time there as well. He is very focused on chasing that last second, and loves to see his time drop. Once again we are the kart taking to VPK to be straightened with the hope it will be ready for Saturday’s night race. That’s right! We are finally racing at our “home” track! I have already changed his visor to the clear one. As long as we can put all the pieces back on by 3:30 or so on Saturday, we should be ready to go. So, come and cheer us on with the other racers.